This paper aims to develop a new free stochastic volatility model, joint with jumps. By freeing the power parameter of instantaneous variance, this paper takes Heston model and 3/2 model for special examples, and extends the generalizability. This model is named after free stochastic volatility model, and it owns two distinctive features. First of all, the power parameter is not constrained, so as to enable the data to voice its authentic direction. The Generalized Methods of Moments suggest that the purpose of this newly-added parameter is to create various volatility fluctuations observed in financial market. 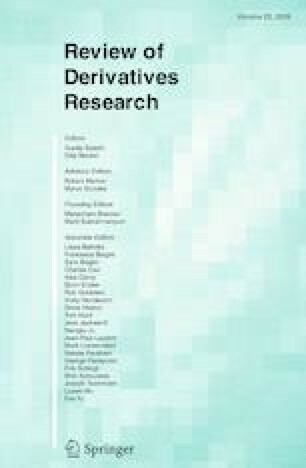 Secondly, even upward and downward jumps are separately modeled to accommodate the market data, this paper still provides the quasi-closed-form solutions for futures and option prices. Consequently, the model is novel and highly tractable. Here, it should be noted that the data on VIX futures and corresponding option contracts is employed to evaluate the model, in terms of its pricing and implied volatility features capturing performance. To sum up, the free stochastic volatility model with asymmetric jumps is capable of adequately capturing the implied volatility dynamics. Thus, it can be regarded as a model advantageous in pricing VIX derivatives with fixed power volatility models. This work is supported by the National Natural Science Foundation of China (Nos. 11171304 and 71371168) and Zhejiang Provincial Natural Science Foundation of China (No. Y6110023). This work is supported by the National Natural Science Foundation of China (No. 11571310A011402) and Jin E. Zhang has been supported by an establishment grant from the University of Otago and the National Natural Science Foundation of China (Project No. 71771199). where we use Remark 2.1 by setting \(\eta \) to be different values and the fact that \(V_t\) is a Markov process. CBOE. (2003). VIX: CBOE volatility index. Available at www.cboe.com/micro/vix/vixwhite.pdf. Sepp, A. (2008). VIX option pricing in a jump-diffusion model. Risk Magazine, 84–89. https://papers.ssrn.com/sol3/papers.cfm?abstract_id=1412339.